Retire with a strategy.Plan ahead. Call 1-866-226-5638 to open an account today. Calculate the growth of your IRA Money Market Account. Earnings grow tax-deferred. You generally pay taxes when you make withdrawals. You must be under 70 1/2 to contribute to a traditional IRA. You must begin taking required minimum distributions (RMDs) at age 70 1/2. Contributions may be withdrawn at any time without taxes or penalties. Earnings may be withdrawn tax-free and penalty-free if your funds remain in the Roth IRA for five years and you have reached the age of 59 1/2. Roth IRAs have no required minimum distribution (RMDs) during your lifetime. **Synchrony Bank does not provide tax advice. Please consult your tax advisor for actual advantages and any potential tax implications before establishing or making contributions to an IRA. Q: Can I transfer my IRA at another financial institution to Synchrony Bank? 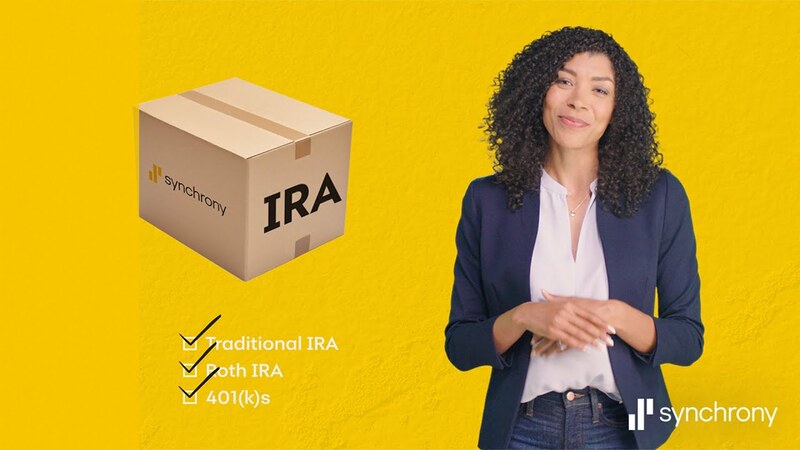 Yes, you may transfer your current IRA to Synchrony Bank. Please contact an IRA Specialist at 1-866-226-5638 to learn more. Once your account is open, additional transfers can be initiated by completing a Transfer Request form. Q: Can I roll over funds from my employer-sponsored retirement plan to my Synchrony Bank IRAs? Yes, you may roll over funds from specific employer-sponsored retirement plans to a Synchrony Bank Traditional IRA. Please contact an IRA Specialist at 1-866-226-5638 to learn more. Q: Can I change the beneficiary(ies) on my IRA account? Yes, you can change your beneficiary(ies) as many times as you wish. Please contact us for the necessary paperwork. These forms may also be found on our Website by selecting Resource Center and Bank Forms. IRAs cannot be opened online.